Digital Alchemy | Where’s the truth in MarTech? 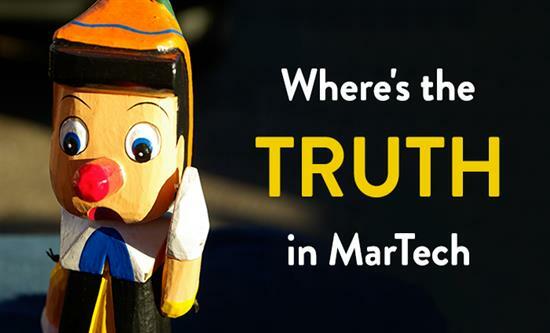 Where’s the truth in MarTech? We live in a world where marketing changes in the blink of an eye, and it’s important to keep abreast of new developments in order to stay ahead in the race. But how do we know what industry best practice is and who do we look up to and go to for guidance? Like most of us, you will be seeking advice from your peers and industry specialists. In light of this I wanted to share two things with you that have unfolded over the past 2 weeks that have been bugging me for a while. Last October I went to DMA in LA and I saw a case study by a global MarTech vendor, the case study looked great, impressive and logically sound. Everything you would expect from a good case study. 6 months later, something triggered my memory, so I decided to reach out to the organisation, let’s call them A, directly to see how it was going as we were looking into implementing the same technology. I got a response immediately and the organisation said they would love to share their experiences with me once they have finished implementing it, which was about 4 months away. A full 9 months after, the case study that indicated it was up and running and getting great results. Organisation A mentioned that the tech had been implemented at another organisation, let’s call them B, and that I should reach out to them directly. Coincidently enough, I knew people at organisation B, so I reached out to them to ask how their implementation was going…the response…”We haven’t finished our implementation yet. You should talk to organisation A, they have already implemented it.” WTF! Not long ago a colleague sent me the most recent Forrester Wave report for Multichannel Marketing. There are 4 MarTech vendors in the “Magic Quadrant”, and one of them, I have never, ever seen successfully implemented. Every time I have seen an organisation trying to implement it, they have given up. To me it all feels a bit like the investment banks and credit rating agencies. The tech companies hide the truth in flashy demos, marketing and spurious customer testimonials, and the rating agencies support them because, well let’s face it…they need the money. To compound the problem, most organisations who have implemented these technologies and failed, remain largely silent because…they don’t want to publicly admit they got conned, as that amounts to career suicide. In any case, if you think new technology is a silver bullet you’re probably wrong, long after the software vendor has got their money and commissions, you’re still going to be there burning the midnight oil trying to make it all work. My advice, choose a long term partner to work with because that’s a more important choice than the GUI’s, the API’s and the Connectors.